ROME, Nov 20 2016 (IPS) - Desertification, land degradation, drought, climate change, food insecurity, poverty, loss of biodiversity, forced migration and conflicts, are some of the key challenges facing Africa—a giant continent home to 1,2 billion people living in 54 countries. 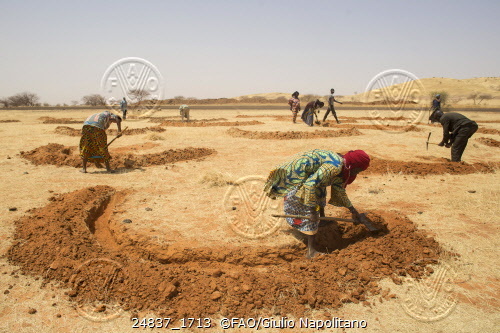 And they are huge challenges indeed, in particular affecting Africa’s vulnerable drylands. Just think that the drylands of North Africa, Sahel and Horn of Africa extend over 1.6 billion hectares home to about 500 million people, i.e. slightly less than half of the entire population of the continent. Such rapidly deteriorating situation, which has been exacerbated by climate change and its growing impact, has mobilised more than 20 African countries around the Sahara (North, East and West), international organisations, research institutes, civil society and grassroots organisations, to build together what has been called: The Great Green Wall for the Sahara and the Sahel Initiative (GGWSSI) or simply Africa’s Great Green Wall (GGW). Asked about specific examples, these are “sustainable management of natural resources, including soils, water, forests, rangelands; promotion of sustainable rural production systems in agriculture, pastoralism and forestry, as well as sustainable production, processing and marketing of agricultural products and forest goods and services, says Berrahmouni. 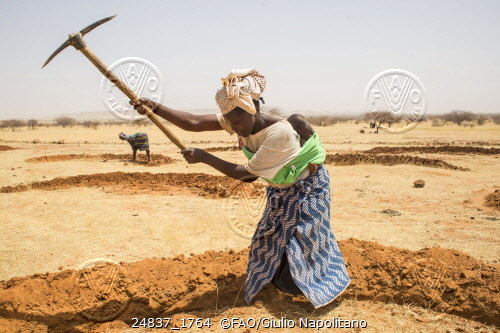 FAO is a key partner of the African Union and of its member states in implementing this initiative. 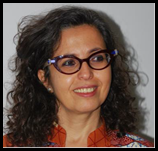 Indeed, for FAO, this is a “game changer in addressing poverty eradication, ending hunger and boosting food and nutrition security in the continent,” the Algerian expert explains. From 2010 to 2013, FAO focused on supporting the African Union Commission and 13 member countries to put in place an enabling environment for the implementation of the GGWSSI. These countries are: Algeria, Burkina Faso, Chad, Djibouti, Egypt, Ethiopia, Gambia, Mali, Mauritania, Niger, Nigeria, Senegal, and Sudan. These projects have lead to: the preparation and validation of national action plans and strategies for the implementation of the initiative in 13 countries; the development and validation of Regional Harmonized Strategy, ensuring that all stakeholders involved in the implementation of work towards a common and shared vision, objectives and results, and to put in place a community of practice for the effective implementation of Africa’s Great Green Wall. Berrahmouni tells IPS that since July 2014 and with the support of European Union and the African, Caribbean and Pacific Group of States (ACP) Secretariat, FAO is implementing with partners a project called “Action Against Desertification” in support of the implementation of the Great Green Wall in 6 countries (Burkina Faso, Ethiopia, the Gambia, Niger, Nigeria, Senegal) and South-South Cooperation in ACP countries. On November 16, FAO presented to the United Nations Framework Convention on Climate Change (UNFCCC) in Marrakech, Morocco (7-18 November), a groundbreaking map of restoration opportunities along Africa’s Great Green Wall. at the UN climate change conference. Announcing that there are 10 million hectares a year in need of restoration along the Great Green Wall, it informs that restoration needs along Africa’s drylands have been mapped and quantified for the first time. The map is based on collection and analysis of crucial land-use information to boost action in Africa’s Great Green Wall to increase the resilience of people and landscapes to climate change.